“Ballast Water, Shmallast Water.” Well, at least that’s what some in the Michigan Senate are apparently saying with the introduction of SB-1212. We’re not sure that there’s much we can add to what has already been written by the Michigan League of Conservation Voters, Drew YoungDyke and others on the topic, but there has been yet another new piece of counter-conservation legislation introduced. This installment represents a threat to the protection of our Great Lakes from invasive species by effectively undoing the 2005 legislation which elevated ballast water treatment and containment requirements for ocean-going freighters. If passed, this bill would reduce the 2005 standards which required that a permit be secured confirming the chemical treatment of ballast water or abstention from discharge by these freighters prior to being allowed to port in Michigan. It is our further understanding that ballast water standards would be reduced to allow for a brine treatment which has been estimated to only be some 90% effective in the elimination of aquatic invasives. It seems that many of the same State legislators who were “outraged” over what they characterized as an inadequate Federal response to the threat posed by Asian Carp (and we would agree), now seem unconcerned about threats to the Great Lakes which are at the bottom of the food web. It appears that some are only influenced by science if they themselves can see it fly through the air. 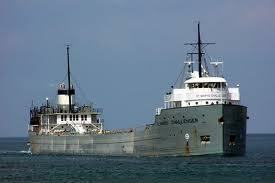 Instead of the State of Michigan lowering its standards on the treatment of ballast water to the lowest common denominator, now would seem to be an ideal time to reignite the momentum which came out of the Great Lakes Compact. This agreement was signed into Federal law in 2008 and provided specific criteria for State and Provincial water withdrawal from the Great Lakes basin. If all Great Lakes states and provinces were to have similarly high requirements for ballast water treatment, then there would no longer be a competition to see who can have the lowest standards. There is little question that most knowledgeable observers of the Great Lakes have continued to be surprised by the resilience of aquatic communities as they have responded to the seemingly endless disruption of these systems and food chains by invasive species. However, to assume that this ability to adapt and sustain in a manner which will always be consistent with our recreational and economic priorities is wishful thinking. To those legislators who argue that the introduction of most or all invasive species is inevitable given the global nature of today’s economies and society –yes, we’ve heard some say this out loud — we would ask that they look to the numerous studies which suggest that by slowing the rate of these introductions their adverse impacts have been reduced to levels which justify the economic investment in prevention or delay. Whatever the perceived economic gain which is being envisioned through the passage of this bill, it is dwarfed by the risks represented by new threats to the lakes and watersheds. Perhaps more importantly, this type of legislation sends exactly the wrong message when those of us in the Great Lakes who are trying to convince D.C. decision-makers of the threat posed by Asian Carp. Sorry Senators, but you can’t have it both ways. You can’t be convincing about your stated concern regarding Asian Carp while at the same time advocating for lesser ballast water standards.